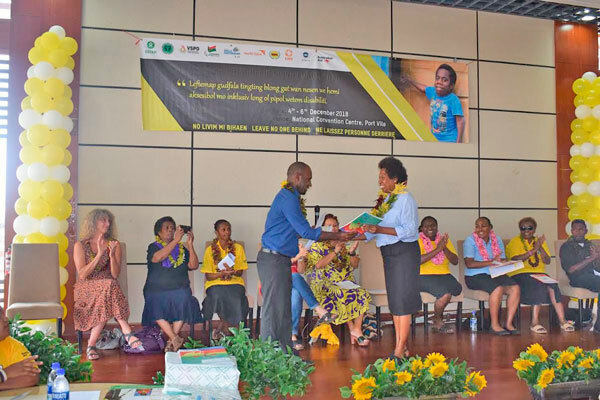 An analysis conducted on the situation of sign language in Vanuatu released yesterday during the opening of the National Disability Forum will strengthen collective action to improve access to sign language. Without including people with hearing impairment at all aspects of development, the government will not achieve its National Sustainable Development Plan and the global sustainable development goals. Sign language is an important tool to help deaf and hard-of-hearing people connect and receive information thus, advancing their rights. However in Vanuatu, the knowledge and use of sign language is limited. Deaf and hard-of-hearing people faces a lot of barriers such as limited education and poor health status. These problems will get worse if the government does not take actions to address them now. The Australian Government funded Vanuatu Skills Partnership decided to address the gap by funding the situation analysis aimed to explore the strengths and weaknesses related to access to sign language in Vanuatu. According to the situation analysis, a sign language will increase opportunities for marginalized deaf and hard of hearing people to communicate, develop social skills, gain and education, participate in cultural and social life, gain access to paid work and participate in political processing. The analysis recognized the urgent need for the development of a sign language, beginning with the creation of opportunities for deaf people to unite and create their community, language and culture. The sign language must be developed in the Vanuatu context so that the government, civil society and partners are familiarize with and can work together more effectively to address the needs of deaf people. The Director of the Vanuatu Skills Partnership, Fremden Yanhambath, said: “To achieve the People’s Plan and the National Disability Inclusive Development Policy, we all need to work together with deaf people to foster sign language and promote inclusion”. He urged all stakeholders to read the report and unite in creating an inclusive and barrier free society. Director Fremden presented the situation analysis to the Director General of the Ministry of Justice and Community Services (MOJCS), Dorosday Kenneth, yesterday.